This product is designed to maximize the capacity for fun at all events. 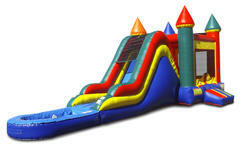 With a larger jumping area and higher slide, the Super Fun Castle is a definite crowd pleaser. To add to the fun, it includes a basketball hoop. It is going to be a challenge to try to take your kids out of it. Also for $60 extra we can add a pool for summer fun with water to cool the kids down.